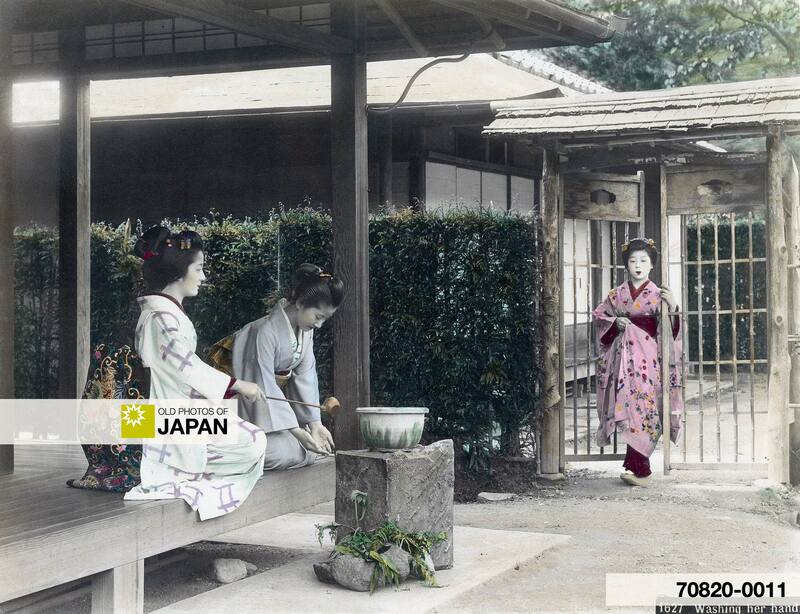 A woman carefully pours (invisible) water on the hands of another woman, while a third woman is arriving at the gate. All are wearing gorgeous kimono as if they are going to attend a tea ceremony, or a similar special event. The water is ladled from a wash basin called temizu bachi. This detail shows the intricate design of the obi (left) and the perfect hair (right). Temizu (手水), literally hand water, is the the custom of using water to purify your hands and mouth. Although this photo shows a domestic scene, temizu is actually a very important aspect of worshipping at a Shinto shrine, where purification is done before entering the shrine precinct. The special shrine structure containing the wash basin is called a temizuya (手水屋). Purification, misogi, 禊) defines Shintoism, which strongly emphasizes purification of body and soul. Such purification can be quite extensive and intense, starting the day before a matsuri (religious festival) or visit to the shrine.1 The purification ceremonies are meant to remove impurities (穢れ, kegare) and sins (罪, tsumi). These include bad luck, disease, guilt or even exposure to blood or death. Purification also ensures that the kami will not be offended and stay away. Even when praying at a small altar at home, many Japanese will do some form of purification beforehand. Some may even take a shower. It is a wonderful non-verbal way to show respect and consideration. One of the most remarkable features of Shinto was the emphasis laid on cleanliness. Pollution was calamity, defilement was sin, and physical purity at least, was holiness. Everything that could in any way soil the body or the clothing was looked upon with abhorrence and detestation. Disease, wounds and death were defiling, and the feeling of disgust prevailed over that of either sympathy or pity. Birth and death were especially polluting. Anciently there were huts built both for the mother about to give birth to a child, or for the man who was dying or sure to die of disease or wounds. After the birth of the infant or the death of the patient these houses were burned. Cruel as this system was to the woman at a time when she needed most care and comfort, and brutal as it seems in regard to the sick and dying, yet this ancient custom was continued in a few remote places in Japan as late as the year 1878. In modern days with equal knowledge of danger and defilement, tenderness and compassion temper the feeling of disgust, and prevail over it. 1. Pour a ladle of water over your left hand. 2. Do the same with your right hand. 3. Pour a little water in your left hand and use this to rinse your mouth. Empty your mouth in front of the trough. 4. Rinse the ladle before putting it back. Although Shinto in origin, temizu can also be found at Buddhist temples. However, most Buddhist temples use a huge brazier full of incense instead of temizu. To purify themselves, visitors wave the smoke over their face and body. Another interesting finding in the same survey was that half of the respondents actually drank the water instead of spitting it out as intended. This totally defeats its ceremonial purpose of purifying the mouth. Does all this mean you can get sick from purifying yourself? 1 The Stockton Tsubaki America Shrine, the first Shinto shrine in North America devotes a full page to misogi. Also see Misogi and spiritual exercises. 2 Griffis, William Elliot (1896). The Religions of Japan : From the Dawn of History to the Era of Méiji. Charles Scribner’s Sons: 84-85. 3 Yokoi K; Nawata R; Furui S; Nagasawa T; Yanase S; Kimura M; Itokawa Y (1991). “A report on the hygienic status of sacred ‘temizu’ water in shrines.” Nippon eiseigaku zasshi. Japanese journal of hygiene 1991;46(5):1009-13. You can also licence this image online: 70820-0011 @ MeijiShowa.com. Thank you for your nice words. I only have a tiny fraction of my collection on the site right now, and hope to be able to show more soon. In regards to to Esaki/Kusakabe: at the moment I am on a trip and am unable to check my notes. The attribution of the photographs is based on a variety of sources, the most important being Photography in Japan 1853-1912 and Old Japanese Photographs: Collectors’ Data Guide, both by Terry Bennett.